A 30-pound catfish noodling catch that went viral has earned this 19-year-old college student a TV show on an online hunting channel. Hannah Barron may be petite — she is only 5 feet tall and weighs 115 pounds, but don't underestimate this Alabama girl when it comes to outdoor pursuits. Catching catfish with your bare hands "takes grit," she said, and she's got the scars to prove it. 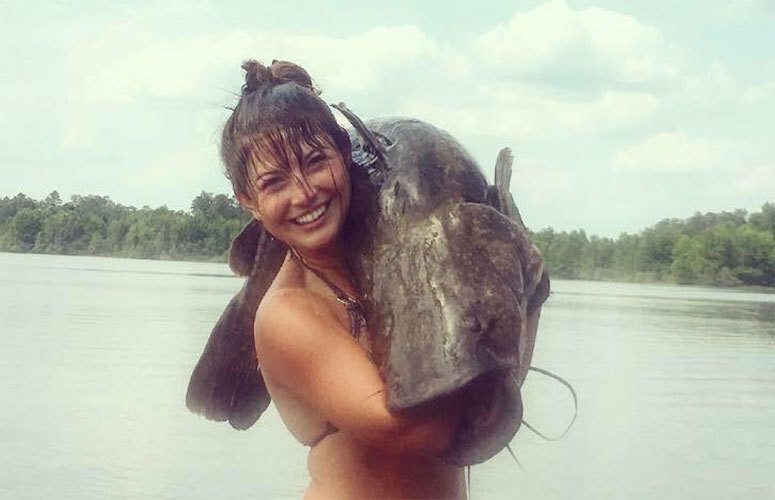 Barron, 19, is receiving plenty of attention after a video of her catching (or noodling) a 30-pound catfish from Lay Lake while wearing a bikini top and cutoff shorts went viral. Soon, the Lurleen B. Wallace Community College alum, will co-host an outdoors program on the Luverne-based Hunt Channel. Details on the show are forthcoming. Barron will also continue her education at Troy University in the fall. Hosting an outdoors program is a dream come true for a country girl who grew up in "the middle of nowhere" Crenshaw County playing in the creek, running in the woods and picking up critters. Hunting, fishing and just being outdoors "is in my blood," Barron said. "It is always what I loved. It was what I was born into. I wouldn't have it any other way. My family has always been that way." Being an only child, it didn't matter that she was a girl. Barron said her father, Jeff, always said he had the best of both worlds. "I can be a girl and a tomboy at the same time," she said. He taught her to identify snakes before she was out of a car seat. He then taught her how to hunt and fish. Barron killed her first deer when she was 8. Shortly after, she learned to clean deer. She's even taken down a 130-inch deer on her own. Barron and her dad hunt whatever is in season whether it be deer, feral swine or turkey. She said she would love to go alligator hunting, but she has yet to draw a tag for Alabama's annual hunt. The Barrons' neighbor is a game warden, and he took Barron and her father noodling at Lay Lake four years ago. They haven't looked back. Noodling is the dangerous practice of catching catfish with your bare hands. Noodlers place their hands into holes where catfish are known to lay their eggs. Barron said common places to find catfish are under boat ramps, in old sea walls, under lake debris and other holes where the sunlight can't reach. "You (stick your hand in and) wait for it to bite you," she said. "It goes against every instinct you've got." Barron said she's been bitten by all kinds of non-venomous snakes and critters, and a catfish bite is definitely the worst. The largest catfish she ever caught, a 50-pound flathead, bit her on the stomach, she said. Barron keeps noodling, though, for the adrenaline rush. Because of her small size, Barron said she takes some extra precautions when noodling. "Daddy and all of them grab (catfish) by the bottom lip and hold on," she explained. "I am scared I am going to get my hand broken so I stick my hand down their throat and grab a handful of guts." That way she's got a better grip when the enormous fish start to spin and fight.